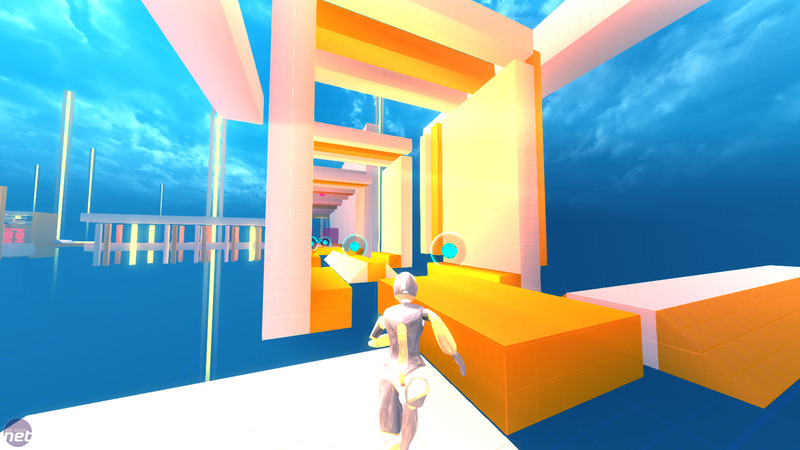 Most easily described as a reductionist copy of Mirror's Edge, InMomentum is a game about speed - nothing else, nothing more. It's what InMomentum does best; everything else, from story to character design, is discarded in order to cram more beautifully frictionless movement into the game. A brief voiceover sequence in the tutorial level hints at a consistent setting in which players are cast as test subjects for a new medical aid; it's a concept that's never mentioned again elsewhere. It almost feels like developer Digital Arrow started working on a larger plot for InMomentum before deciding to abandon the idea completely in order to add a few extra MPH. InMomentum is therefore a game without a story. There's no connecting thread running through the game, there's just the game itself - and it's glorious. 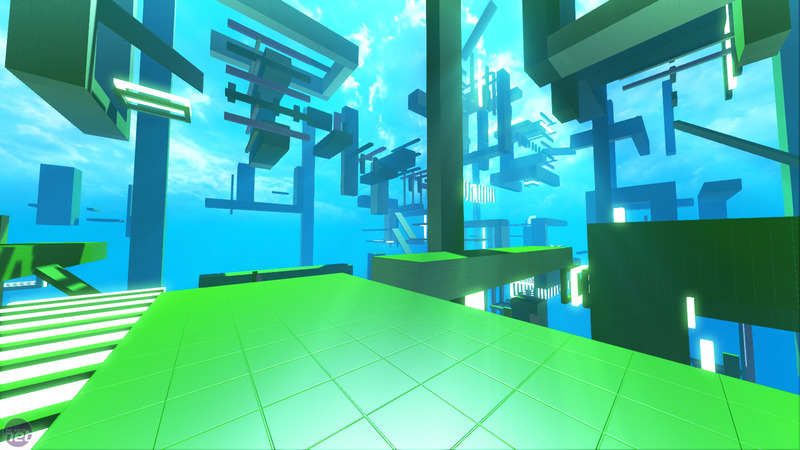 Abstract levels built out of floating cubes are the dish of the day, evoking memories of Lawnmower Man and Trackmania Sunrise's platform mode in equal measure. Dots of light - the tutorial calls them 'Data spheres' - form a neon breadcrumb trail for you to follow if you're unsure, but the real focus is on flinging yourself forward as fast and imaginatively as possible. InMomentum's fundamental building blocks slot into place with disarming ease, with simple rules of movement allowing for a huge amount of aerial freedom. A basic ground-jump is useful for hopping from platform to platform, but then there's the wall-jump ability that lets you re-launch yourself off vertical surfaces and get a mid-air boost. You need to reset it every two jumps, which is achieved by touching new vertical surfaces, but that only sows more creativity into the environments as you look for the perfect place from which to leap-frog off. It's here that InMomentum works best; diving around like a loon, bouncing off everything and constantly gritting your teeth as you will yourself to fly that extra few feet...before collapsing in defeat as you fall into the void and are forced back to the last checkpoint. In the finer details however, it all starts to fall apart. Sizeable flaws in InMomentum's structure and size poke through, acting as speed-bumps on an otherwise beautiful racecourse. Problems range from the lack of levels and game modes on offer through to the fact that we've not even seen a single multiplayer match in the entire of InMomentum's launch week. This is not a good sign. Further issues abound - mouse sensitivity that resets to maximum whenever you load a level, for example, while the difference between difficulty levels is never explained. Plus, while the screenshots and videos imply that you can switch to a third person view, there's no mention in the tutorial or controls menu of how you actually change the camera. InMomentum is an incredibly fast-paced game, and that speed makes it an incredibly more-ish and enjoyable experience when it works. It's also worth mentioning that the developer has promised future fixes and free DLC to expand and improve the game. Unfortunately, though, because the current version of the game is wrapped in a mire of niggles and glitches, and because it hasn't secured the amount of content or popularity that might give it lasting appeal, InMomentum doesn't get the recommendation that may have otherwise been within its reach. EA has finally unveiled the minimum system requirements for the new platforming FPS, Mirror's Edge.